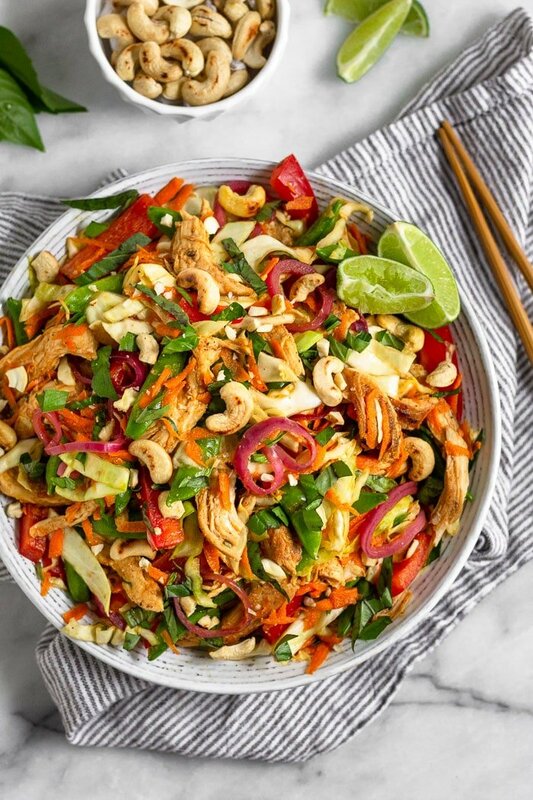 Light and flavorful Vietnamese Chicken Cabbage Salad with cabbage, chicken, veggies, cashews, basil, and a refreshing dressing. Paleo, Whole30, low carb, and gluten free! Spring is here and it’s salad season! I mean I can eat salad every single day, but now that it’s warmer, my body is craving lighter foods. 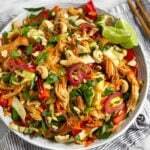 So today I’m sharing this Vietnamese inspired chicken cabbage salad! The dish I loved the most was their chicken and cabbage salad. 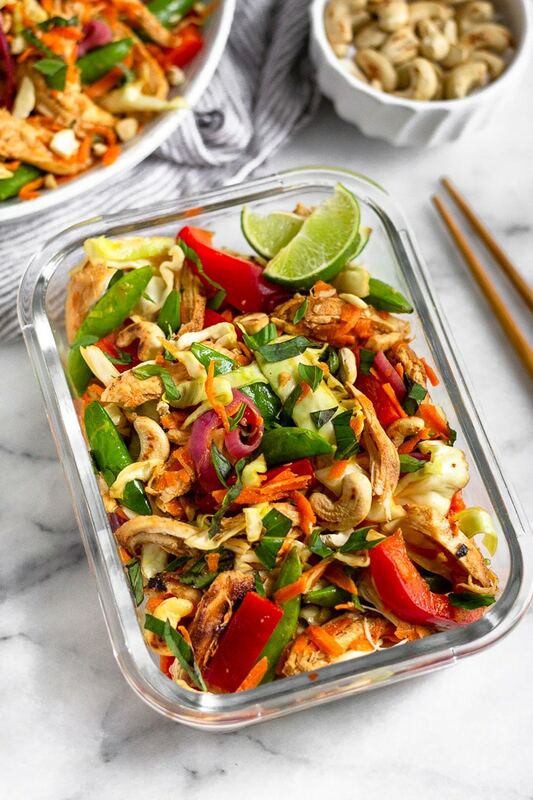 It was full of veggies, chicken, crispy shallots, fresh basil, and a delicious sauce. 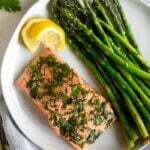 It was so simple yet so tasty, and from what I could tell, pretty good for you as well! After thinking about that salad for about a week after having it, I decided to recreate it, like any other food blogger would do haha. I based my dish off their salad, while changing it up a little as well. I took out the fried shallots and added quick pickled onions instead. I also added some cashews for some more crunch and healthy fats. 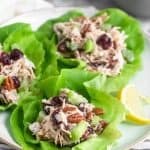 Those easy swaps make my version of chicken cabbage salad paleo and Whole30 approved! I know it looks like a lot, but I promise it is easy to make. First make the quick pickled onions and let them marinade while you do the rest. Then get cooking. 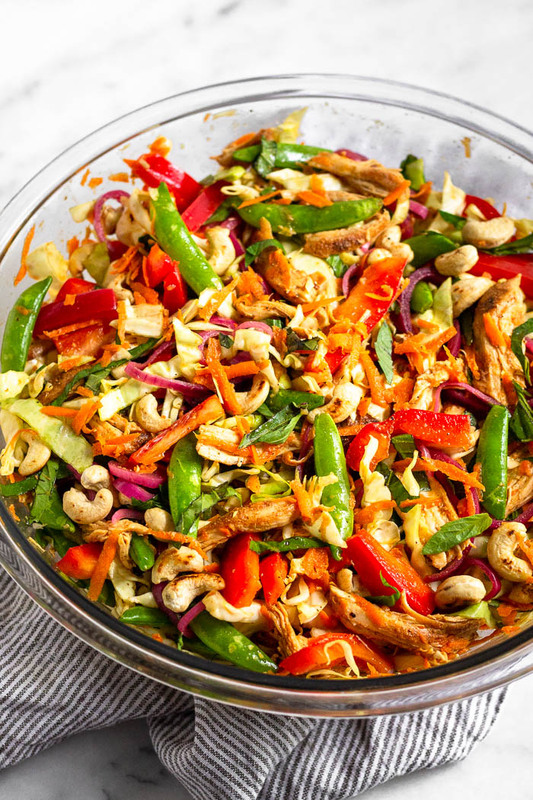 Start by toasting the cashews in a large sauté pan until lightly golden brown on the outside. Add the oil to the pan and and cover the chicken with the ginger, garlic, red pepper flakes, and salt and pepper. Pan fry the chicken until it is browned on the outside and cooked through, about 25-30 minutes depending on the thickness. Next you get to chopping!! Cup up all the veggies according to the recipe and add them to a large bowl. Then make the dressing and set aside. Hopefully the chicken is almost done and then you just need to assemble. Once the chicken cools some, shred it and add it to the bowl with the veggies. 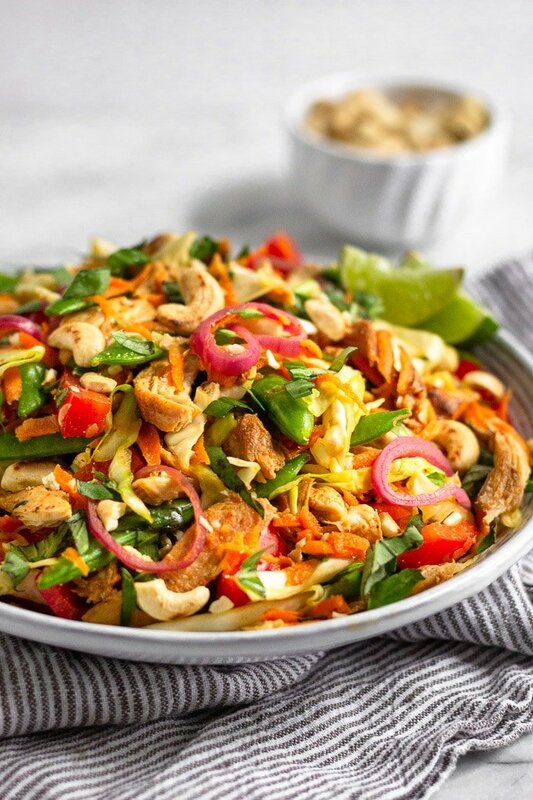 Toss the chicken and veggies with the dressing to combine. Finally add in the basil and cashews (if going to eat right away) and mix again. This salad makes a huge batch. Like filled to the top of the biggest bowl I have huge. Even though it makes a lot, we go through it pretty fast. It was gone in only 3 days at our house! We eat a lot haha. 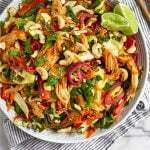 Make the salad per the directions, but leave off the cashews. Store them separately and then add them as you eat the salad. If you mix them in when making it, they will lose a little of their crunch if you aren’t going to eat it in the next couple of days. If you decide to mix them in, they will still be good though! 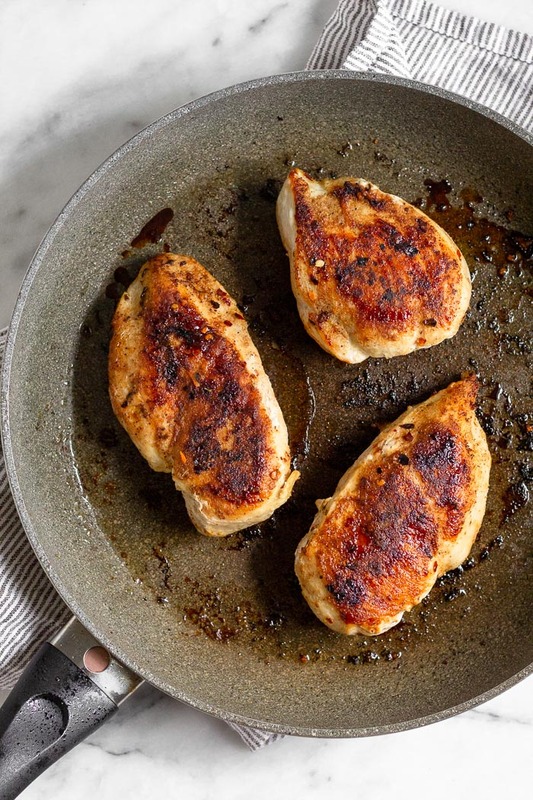 If you already have shredded chicken, you can substitute that instead of the pan fried chicken breast. 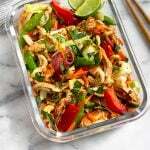 I find the seasoned chicken breast works the best for this recipe, but the shredded chicken makes an easy substitute. 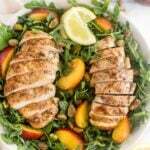 This recipe is perfect to make on Sunday and then have it for lunch or dinner throughout the week. It pairs really well with rice (cauliflower or regular white), or you could load it in a baked sweet potato. We served it with a said of air fryer potatoes (minus the rosemary) and it was a great match! Michael said it would be good in a sandwich so if that sounds tasty, go for it. It will last in the fridge for up to 5 days in a tightly sealed glass container. 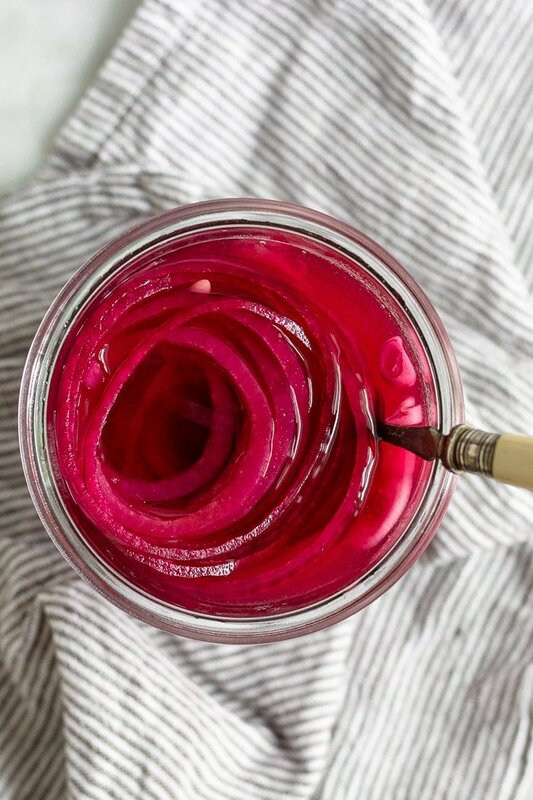 Make the pickled onions. In a large jar add onions, water, apple cider vinegar, and 1 teaspoon salt. Shake well and set aside. Toast the cashews. Heat a large nonstick skillet over medium-low heat and let it get hot, about 30 seconds. Add cashews and toast for 3-4 minutes, stirring constantly, until golden brown. Remove and set aside. Make the chicken. Mix garlic, ginger, red pepper flakes, and salt and pepper in a small bowl. Rub evenly over chicken. Heat the same skillet over medium heat and add avocado oil and let it get hot, about 30 seconds. Cook chicken breast until cooked through and no pink remains, about 25-30 minutes, flipping 2-3 times. Once it is done, remove from heat and let cool. Shred with either a fork or pull apart with your hands. While the chicken cooks, make the dressing. Mix all ingredients in a small bowl. Set aside. You can also cut up the veggies while the chicken cooks to save some prep time. 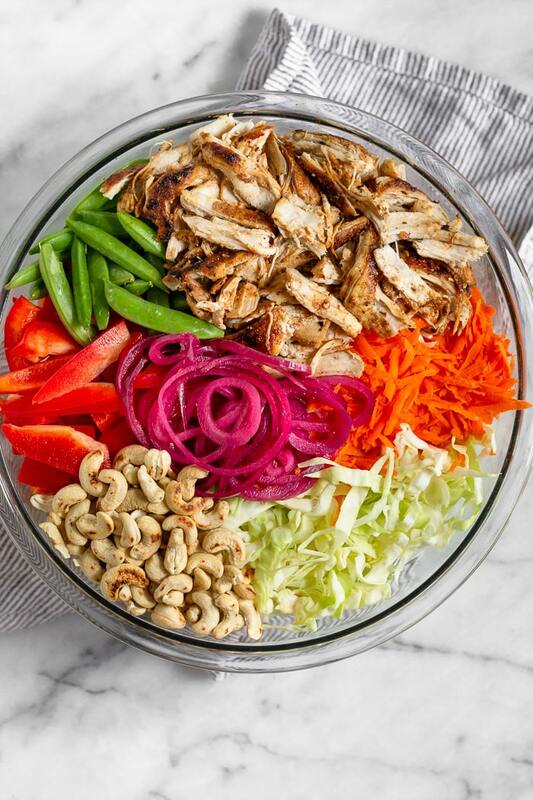 In a large mixing bowl, add the cabbage, peppers, carrots, snap peas, pickled onions, chicken, and dressing. Stir to combine. 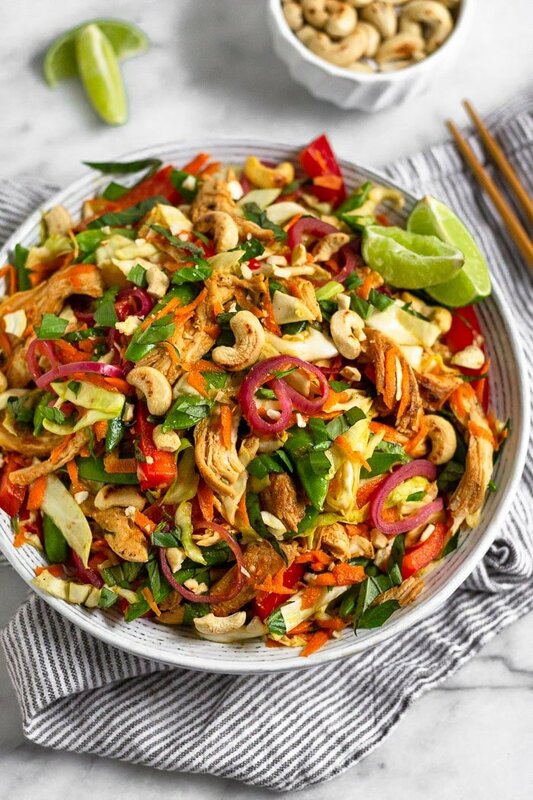 Add cashews and fresh basil and stir once more. 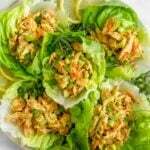 Keep in fridge in a covered glass container for up to week. Enjoy! To save time, prep/chop the veggies while the chicken cooks. This recipe was previously posted and was updated this year! Chicken and cabbage are some of the BEST things to go together. 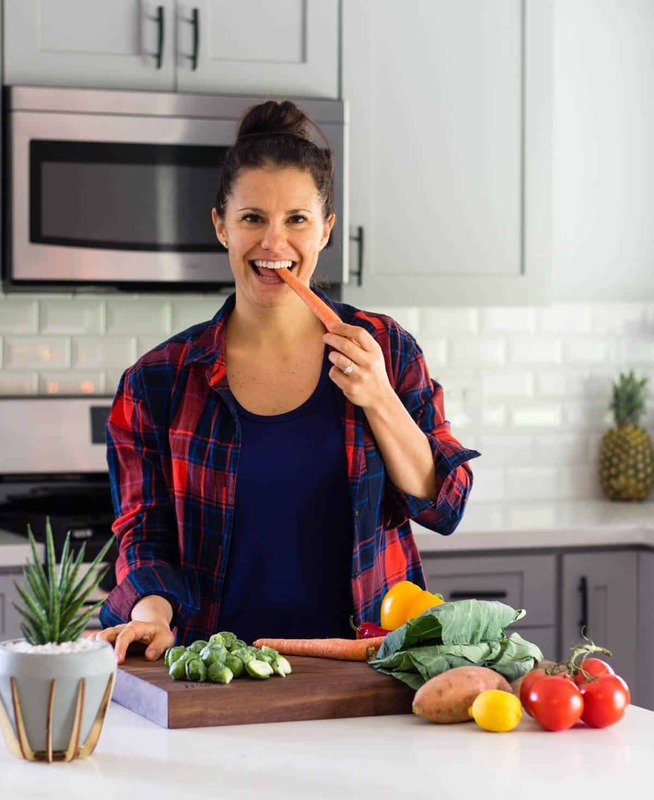 That’s so neat that you came up with it after going to a restaurant; I would love to get together with some bloggers… They always make me not feel self conscious about taking a photo of my food. Yes you should def look into that Em! Maybe try a google search. I found mine through Instagram. I’m sure there is one in Denver, but I’m not sure how far you are from there. It is nice to be with people that share some of your passions! What are coconut aminos and can I find them at HEB? Also is it something I can omit or substitute? Thanks! Coconut aminos are like soy sauce but without the soy and gluten. I get mine all the time at HEB – they should be in the gluten free section or the Asian section (I’m leaning towards gluten free though). If you can’t find them, you can use gluten free soy sauce or regular soy sauce. Hop you enjoy Kimberly! I made this for a family BBQ and it was a hit!! So much flavor! I highly suggest cooking the chicken breast in the spices as it adds so much more flavor. I’m glad I had extras so I can eat it for leftovers this week! So glad to hear that Kimberly! I love it for leftovers as well. Thanks for trying it!